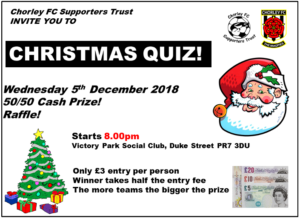 Come along to our Christmas Quiz in the Social Club on Wednesday December 5th. Entry is just £3 per person, which includes a turkey sandwich or vegetarian alternative. The prize will be half of the entry fee. Last year we had about 50 people take part so the prize would have been well worth winning: £75. The monthly Trust meeting will begin at 7:30 and be over in good time for the quiz. Quizmaster Chris Blackburn will be getting things under way at 8pm. There will be a picture round and five rounds of ten questions, with a break for something to eat half way through, and a raffle. Bring your own team or just come down and join a team on the night.